In 2017 I set a goal to spend 7 hour a week outside with at least one other member of my family. As I’ve tracked this throughout the year, most things have been pretty straightforward, but on many occasions I’ve run into a situations of ambiguity. Am I Inside or Outside Right Now? Reading in our living room? Easy. Inside. Throwing rocks into the water at the beach? Again, easy. Outside. Sleeping in a tent in a National Park? We’re sort of ‘in the great outdoors’ but we are inside of the tent. Does that thin sheet of nylon make us inside? Sitting on the porch eating? What if the porch is covered? What if it is also screened in? At what point do we cross over from inside to outside? Is being deep in the woods more outside than sitting on top of a 100 square foot patch of grass in front of our house? Is a rooftop in the city as outside as a dock on the lake? Is being in a natural cave inside or outside? Surely it was the first sort of inside that humans lived in, but being in a cave seems pretty outside-like these days. What we’re presented with is the idea that outside is less of a binary and more of a spectrum. I’ve come up with a rough litmus test to help me define the outside-ness of an environment. Can a bug, flying in the wild, come land on me? If it rains, will I get wet? If a breeze picks up, will I feel it? During the day, is natural light the primary source? Is it difficult or impossible to control the temperature? Is the area around me a biome that supports non-human but larger-than-microscopic life? Is my view of things that are primarily untampered by humans? As the number of those statements that are true increases, so does the outside-ness of a place. Thinking back to my examples from earlier in the post. Is being deep in the woods more outside than sitting on top of a 100 square foot patch of grass in front of our house? 7/7 vs 5/7. So, yes, it is more outside. Is a rooftop in the city as outsides as a dock on the lake? 5/7 vs 7/7. So, no, it isn’t. Is being in a natural cave inside or outside – 4-6/7 (depends how deep the cave is). So, it is outside. How Can We Use This Litmus Test? Aside from measuring the outside-ness of the place we are, this litmus test can also be used to help us design our inside spaces feel more outside. I personally feel more at ease when I am outside and so increasing the outside-ness of the spaces I most often occupy would likely contribute positively to my mental well being. This makes a lot of sense, our species has spent most of its existence outside and is better adapted for that. We can’t expect to be fully comfortable in a space that our bodies are not optimized for. Probably because of that, the idea of space that blends inside and outside has fascinated me when I’ve encountered it. Visiting the famous Frank Lloyd Wright designed Falling Water, I was fascinated with how there was a stairway from the living room leading down to a river. At the top of those stairs, with the glass closed, the outside-ness starts at 2/7 and as you open the glass, and walk down the stairs, your outside-ness increases to 6/7. I will periodically stumble across other images of houses that blend inside and outside, like this one, a house with a tree growing in the middle of it. It would seem that just a step, not even through a doorway or barrier, could put you from 2/7 to 6/7. 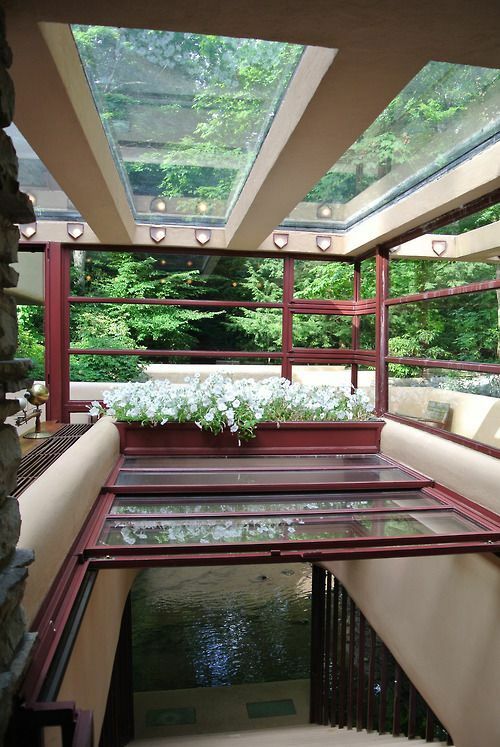 I’ve seen other houses with interior courtyards, retractable roofs, sliding walls or no walls at all. In places where the weather creates a habitable temperature, rainfall is light and bugs are rare, it might be possible to design a living space that doesn’t have very much inside at all. Would we be happier if more of our living spaces were a bit higher on the outside-ness scale? What would the downsides and challenges be? How could we minimize them? Would they be worth the benefits produced? Posted on December 25, 2017 December 25, 2017 Categories My Thinking On Various TopicsTags 2017 HabitLeave a comment on What Is Outside? If we ask questions – as Socrates warns us we must – eventually our ability to answer them becomes limited by the data we have available. If we wait until we have the question to start collecting data, it will take us some amount of time to get baseline data and then even more to measure change during experiments. We won’t have our answer for some time – weeks, months or even decades. We might never get an accurate answer. This is why we must record data that we do not yet know how we will use. Some day we will have a question that these data can answer. This is why we must bear the burden of recording and storing information. Some day an important question will be quickly answered because of the hard work we put in now. Here is a story to highlight one recent, though not all that important, example in which I experienced this. In 2015 I started tracking how frequently I participate in various hobby activities as a way of measuring the enjoyability and balance of the life I have created, and am creating for myself. It is more precise, and thus less overwhelming, for me to make the statement “I feel happiest when I surf at least 12 times a year but I’ve only surfed 8 so far” than to deal with some ambiguous emotional statement about “not felling like I surf enough anymore”. The former is actionable – creating the opportunity for four surfing sessions is fully possible by booking a week vacation on whichever coast/island is getting waves in the next month. Problem solved. The decision I periodically consider is whether 12 times a year is really cutting it and if not, what would be required to increase that number. The two biggest things I hypothesize are limiting my frequency of surfing are accessibility and other priorities – mainly the fact that I have a job and three kids. I am easily able to test how limiting other priorities are by looking at windows I have now for other hobbies that could in theory be substituted. The former is more challenging to test – how much does accessibility really impact frequency? How much did I really surf when I lived two blocks from the beach & how does it compare to my target of 12 times per year? Was it really every day, 365 times per year, like I sometimes hyperbolically state? Or was it actually more like 2-3 times a week – for 100-150 total surfing sessions per year? Or was it really 2-3 times per week during the good half of the year and very few during the bad part for a total closer to 50? Would greater accessibility affect things by a factor of two, or an order of magnitude? How can I answer that question? I could try to recall how much we used to surf – and how that changed as I moved further away. But my memory isn’t precise and is biased to remember things I enjoy. I am frequently reminded the fallibility of recall. I could try to track data on the surfing population and compare frequency to accessibility – but would laborious and I wouldn’t have my answer for months. Fortunately, I solved the problem for myself a long time ago. I logged data that is useful here. I’ve been tracking things about myself for over a decade. The largest set is from a longitudinal project in which I track every minute of my time during a sample week, once per quarter. These data go back to when I was still in college, which means it captures a wide range of life – from student, to gap year, to young professional – from bachelor, to husband, to father – from Pittsburgh, to Newport Beach. to San Francisco. I took a look at two sample weeks during my Newport Beach years when I was a two minute walk from checking the conditions. I surfed on six days of the week for a total of nine hours during the first week and four days for a total of four hours the second week. By averaging those I ended up at five days for 6.5 hours. Assuming those weeks are an accurate sample (which I trust with decent certainty due to my methodology) that would put me in the 200-250 a year range. 15 – 20 times more than my current target. Now some of that has to due with difference in lifestyle – but I can normalize for that by looking at how frequently I run now compared to periods closer to those sample weeks. That math accounts for a factor of two to three. So we are left with the conclusion that moving into a house two blocks from the beach would increase the amount I surf on a yearly basis by a factor of 5 – 10. Not insignificant. This ultimately leaves me with value questions. How important is surfing to me compared to other hobbies? How important are hobbies to me compared to other priorities? But what I am not left with is ambiguity about the effect of the change – which means I can focus on those important questions and approach them from a solid base of facts rather than emotion. Thanks to data I recorded previously for one purpose, I was able to quickly answer a new question with relative accuracy. That is why we track things, even things we aren’t quite sure how we will use. At some point in the future we might be better equipped to use them. Tools, methodologies and questions that arise in the future are what will give value to our task of recording data today. As I looked back at the data I had so preciously recorded and saved, my only regret is that I do not have more. More frequent samples, more details & more types of things recorded. This is what gives me the drive to track all the things I track now – of which the list is growing. The thing I dread the third most is collecting data. Usually by manually logging it in some spreadsheet. It isn’t uncommon for me to log things in three to five different systems on a given day. The period when I’m experimenting on myself and have to track things is always such a chore and I am so relieved when an experiment ends. The thing I dread the second most is having to analyze the data. I usually get into flow once I start, but these days, with windows of time to focus being limited, a file of raw data brings more dread than joy. The thing I dread the most, however, is not having data when I make important decisions. Without data, not only will you be inaccurate more often, but you will not know how inaccurate you are. Data helps us be more accurate and also helps keep our gut in check my reminding us how often we aren’t correct. That is why I press through the things I dread second and third most.